For Turkish families, no week is complete without a trip to our local bazaar (pazar) to stock up on our fresh fruit and vegetables for the week ahead. We’ve been doing this since Ottoman times, and our bazaars stock so much more than food – cleaning products, clothes, underwear, heaters, slippers, and even your favourite football team’s jersey. 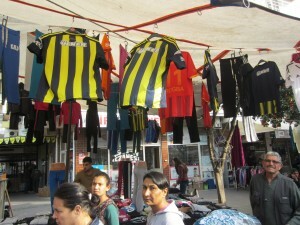 In Selcuk, our bazaar is held every Saturday morning in a big car park behind the bus station. 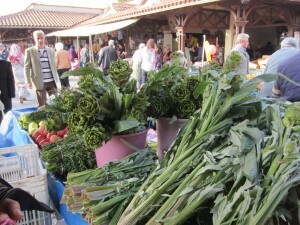 Stallholders make their way into town from farms outside of Selcuk at the crack of dawn on a Saturday morning, trucks laden with freshly-picked seasonal produce as well as household staples. The land surrounding Selcuk is remarkably rich and fertile, and the area is particularly famous for its olives, citrus fruits and peaches. 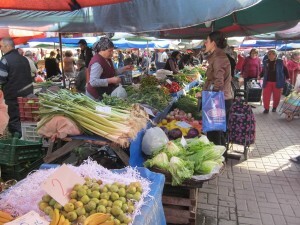 Unlike some local bazaars, this bazaar is set up in a carpark, and so the stalls are laid out in orderly rows making it a great place for your first visit to a weekly fruit & veg bazaar. If you are in the area on a Saturday, I highly recommend you visit, but a word of warning – this is not for the feint of heart. When you arrive, the first thing you will notice is the carnival-like atmosphere, and your senses will go into overdrive as you take in stall after stall of fresh, organic fruits and vegetables, herbs, spices, pastes, eggs, sauces, jams, cheeses, grains and nuts. The next thing you will notice is the prices. 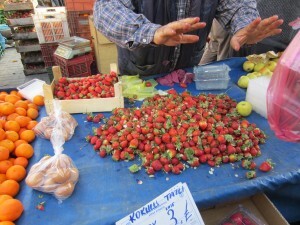 Prices at the bazaar are jaw-droppingly cheap – a kilo of strawberries can sell for around 3TL / kilo, or a kilo of mushrooms will set you back only 7TL depending on the time of year. Prices like these make it easy to manage a household budget, and the produce is much fresher than can be found in a supermarket. The air will be alive with the sound of stallholders bantering with each other as they try to get the attention of shoppers’ and of intense conversations between shoppers and stall holders as they ask about the merits of the produce. 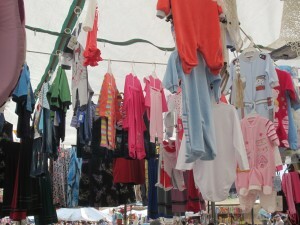 Stallholders will press samples into your hands as you pass, hoping to entice you to shop with them. They will also earnestly try to convince you why their produce is better than their neighbours’ offerings. 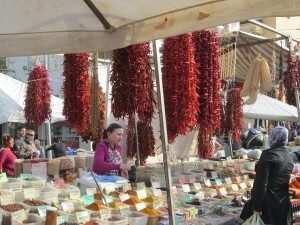 Often the most crowded stalls are a clue that the stall is selling something extra special. Don’t be afraid to roll up your sleeves and jostle with the crowd to take a closer look. 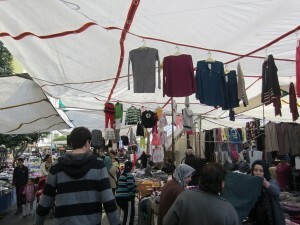 You will notice that many of the shoppers have their “pazar araba” or shopping cart. This is a must for the serious shopper – it makes it easy to drag the family’s weekly shopping home and leaves your hands free for checking the produce. While a shopping cart might not be considered “cool” in some countries, here it is a must-have and shows your shopping smarts. Because most families do their weekly shop here, stallholders are used to selling things by the kilo, so don’t be surprised if they are confused if you try to buy just one or two of something. After you have made your way around the bazaar, I recommend you stop and have a cup of fresh Turkish tea at one of the cafes on the edge of the bazaar, and sit and take in all of the bazaar craziness from a distance. 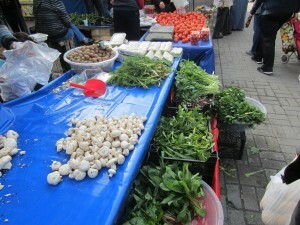 And finally, just a small language tip – although in English it might be more intuitive to say the word “market” instead of “bazaar”, if you ask most Turkish people where the local market is, they will direct you to a supermarket. 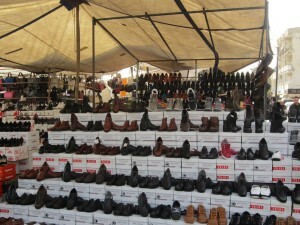 So instead, it’s best to use the word “bazaar” which is closest to our word “pazar”.